Time Location charts otherwise known as Time Distance charts, Time Chainage charts or Space Time charts, plot activities against both Time and Location (usually as a Distance known as a Chainage), as opposed to Gant charts which plot activities only against Time. Time is shown on the vertical scale, location is shown on the horizontal scale, and the activities themselves are shown as, lines, boxes or symbols within the body of the chart.. For more general information see What is a Time Location Chart. 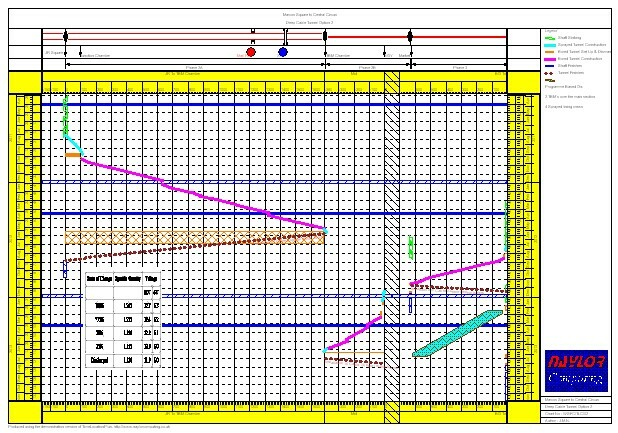 Most project management software does not provide in built Time-Distance capability; consequently if such an output is required users must draw the required chart using a drawing package or a spreadsheet such as Microsoft Excel. Such charts are very difficult to modify if things change or to use as a tool for developing the overall programme. Various Time-Distance software packages are now available on the market, but almost without exception these have been developed as stand alone packages where it is intended that all the project planning, resource loading, progress etc is undertaken in the Time Distance package. But this ignores the fact that the majority of projects, even simple linear projects still have a bar chart as the main contractual monitoring tool and the majority of the planning is undertaken on the project management software that produces this bar chart such as P6, Microsoft Project or Asta Powerproject. Although interaction between the bar chart planning software and these Time Distance packages can sometimes be undertaken, this is invariably a complex process requiring the use of wizards and 3rd Party tools such as Excel. With Time Location Plus you can eliminate all of these complex steps. Time Location Plus is different.It does not aim to duplicate functions present in all the standard bar chart packages but instead integrates with the standard project management packages making drawing a time distance chart as easy as drawing a resource histogram. o this end, the only information that needs entering within the project management software, is an activity code to tell Time Location plus what type of activity it is and of course the start and finish location. After that it’s just a click within Time Location Plus and the data is imported in seconds and the Time Chainage chart drawn. Modify the data in the project management software and simply re import…. It takes only seconds. Time Location Plus interfaces directly with Microsoft Project, Asta Power Project and Teamplan. It imports from Primavera .xer and .xml files and so can be used with any version of P6 (P3e, P4, P5, P6, P6v7, P6r8, Contractor and Risk Analysis). In case you are not using one of these packages Time Location plus will also import data from MPX files, Excel and comma separated files, so no matter which package you use Time Location Plus should serve your needs. And if your project is so simple that a project management package is not in use then you can draw and edit the data directly on screen. Speed and ease of use are the driving factors in Time Location Plus. Data to produce the chart can be imported in seconds direct from most popular planning packages, cut and pasted from spreadsheets or drawn directly into Time Location Plus. Forget about bloated user interfaces and incomprehensible tools. Time Location Plus has been engineered to provide the most advanced functionalities in their simplest form. Creating Time Location Charts is usually a painful process but thanks to Time Location Plus a sophisticated and accurate time location chart is just a few mouse clicks away! All necessary features are fully available in the finished chart. Flexible shutdown periods, headers, pictures and notes make the appearance of the chart fully customizable, even multiple different chainages are supported. Fully flexible chainage input means that working in the US or on Railways is no problem because Time Location Plus offers full support for chainages in Miles, yards, chains or a combination of these as well as the more normal unit input (Km). The resulting chart can be viewed on screen, printed to any windows compatible printer (Tested up to A0 in size), or output as a windows metafile. Read on for help on how to use Time Location Plus the fastest Time Location Package on the market.